The BBC’s weekly The Boss series profiles a different business leader from around the world. This week we speak to Therese Tucker, founder and chief executive of US financial software business BlackLine. To set up and grow BlackLine Therese Tucker spent her retirement savings, maxed out her credit cards, and took out a second mortgage on her home. Meanwhile, two friends lent her money so that she could pay her staff’s wages during the leanest months. That risk – to Ms Tucker and her friends – paid off. BlackLine, which was launched in 2001, is today worth more than $2bn (£1.6bn). And Ms Tucker’s personal fortune is estimated at $380m. This makes her one of the richest self-made women in the US, according to Forbes magazine. Because Los Angeles-based BlackLine doesn’t sell any consumer products, it is not a company many people will have heard of. It is, however, used by more than 2,200 firms around the world, which it provides with cloud-based accounting software. With annual revenues of $177m in 2017, and 800 employees, its clients include Coca-Cola, eBay, Philips and Under Armour. 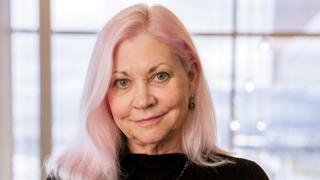 With pink hair and a gregarious laugh, Ms Tucker – who is in her mid-50s – says that being an entrepreneur is in her DNA, and that she is comfortable taking risks. Yet when she started BlackLine she says that she didn’t even consider trying to find a venture capital fund to invest in her business. Ms Tucker adds that because she had tried and failed at a few start-ups in the past, she believed that no investors would back her at the beginning, because she didn’t have “any other successful start-up under my belt”. So instead she had to rely on her own means of raising funds, and the two friends. Even if Ms Tucker had looked for formal investment when she started BlackLine in 2001, the odds would have been stacked against her for the simple reason that she is a woman. Despite the amount of time, money, and lip service spent recently in trying to diversify the technology industry, only 15% of all US venture capital dollars invested in the sector in 2017 went to firms with a female founder. That is according to All Raise, a pressure group dedicated to seeing more women in senior roles in the industry. Brought up on a farm in the Midwest, Ms Tucker got a degree in computer science and mathematics from the University of Illinois. Her first job was working for Hughes Aircraft in southern California, and then she became a freelance software programmer. Prior to launching BlackLine she was the chief technology officer at software firm SunGard, a job she had resigned from to spend more time with her two young children. It was a meeting with her personal finance manager that inspired her to launch BlackLine. Ms Tucker noticed that the tax software the company was using was cumbersome and inefficient. She knew she could build something better, and so she did. While BlackLine was initially self-financed, it did ultimately secure £200m of investment in 2013 from private equity firm Silver Lake. It then floated on the Nasdaq stock exchange in 2016. “In the tech world these floats are few and far between, and the fact that she was able to do that after bootstrapping this – it’s a real testament to Therese,” says Christie Pitts, general partner of Backstage Capital, an investment fund that backs women, people from an ethnic minority, and the LGBT community. Ms Pitts adds that Ms Tucker stands out in the tech world for building such a successful company as a woman over 40, as a “counter-narrative to the usual tech story”. In a world with much handwringing about the lack of female tech founders, it’s surprising that Ms Tucker isn’t a household name. She recognises that the tech industry should do more to attract and retain women, but is relieved that she didn’t know that when she was starting out. Ms Tucker says she was instead too busy building her company to be discouraged or distracted by gender disparity. She does, however, recognise that sexual harassment used to be part of everyday life in the corporate world. “That was the environment that all young women who are my age have worked in,” Ms Tucker says, adding that women learned to “laugh it off at how gross some people were”. Ms Tucker says that one woman she worked with in the past complained about sexual advances from their boss, and was completely sidelined as a result. She later hired that woman. In today’s workplaces, Ms Tucker says one big positive is that younger women have learned to negotiate for better pay and working conditions. She believes that too many women, when helping to build a business, opt to sacrifice their own salaries for the good of the company. “That’s great if every single person does that,” she says. But men, she goes on, are traditionally better at asking for more money and shares in exchange for their work. For Ms Tucker, she says working on her family’s Illinois farm as the youngest of four girls prepared her for life as an entrepreneur. The sisters were expected to do everything to help out – drive tractors, fix cars, feed the pigs and chickens, harvest the soybeans, corn and oats. “People are saying, ‘Oh you’ve broken these barriers’ and I’m like, ‘What barriers?’ I didn’t know they were there,” she says.